Previously I haven’t been a big fan of fondant, or sugar paste – pretty as it may be, it is usually an awfully sweet and rubbery substance when you eat it, in my opinion. 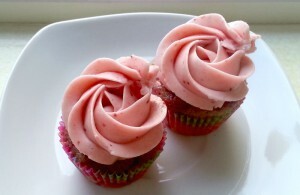 While I enjoy pretty things, I value taste over visual perfection when it comes to food, and especially cake. I want my precious calories’ worth in flavour! Therefore I usually prefer to use marzipan for decorating cakes; however marzipan is more fragile to work with, and it can be difficult to get the same intense, beautiful colours as with fondant. 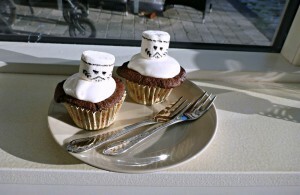 So when I got a request for Star Wars-inspired cupcakes, I decided to give homemade marshmallow fondant a go, and it turned out to be a great success! 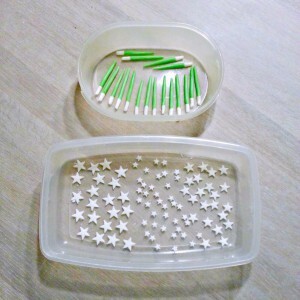 I used about half a portion for making miniature stars and lightsabers for 18 Star Wars blondie cupcakes. If you want to use it to cover entire cakes, Wilton has a chart with fondant amounts to cover cakes which you may find useful. 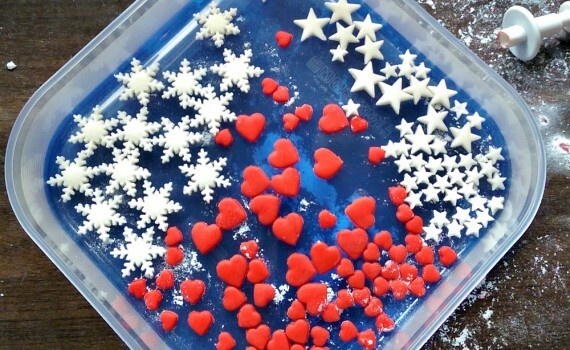 If you want to colour your fondant, I recommend that you use food colouring paste which gives you beautiful results with incredibly small amounts – add just a little colouring at a time by dipping the tip of a toothpick or similar into the paste, whipe it off into the fondant and give it a good kneading to incorporate the colour evenly. You can also use liquid food colouring, but you may need to add some extra confectioner’s sugar if the fondant gets to sticky. 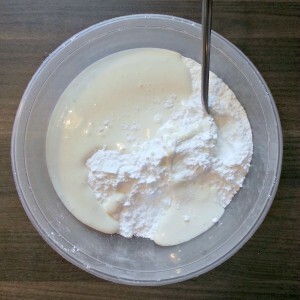 Add the confectioner’s sugar to a medium-sized bowl and put it aside. Combine chopped marshmallows and white chocolate with lemon juice and oil in the bowl of a double boiler and place it over boiling water. Use a heat-resistant spatula to stir while it melts. 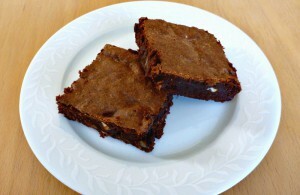 Stir until the marshmallows and the chocolate has melted completely and you have a smooth mixture. Pour it over the confectioner’s sugar and stir to combine as much as you can. 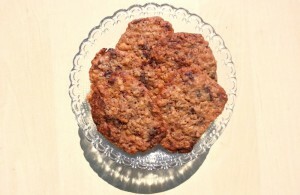 Knead the mixture with your hands until it is smooth and has a consistency similar to chewing gum. It is okay if it is a little sticky, it will change while it rests in the fridge; if it seems very sticky you can add a little extra confectioner’s sugar. Add food colouring paste at this time as well if you want. Wrap the marshmallow fondant tightly in plastic film and leave it in the fridge for about 30 minutes. Knead the fondant to warm it up and make it soft again, and you’re ready to go! NOTE: You can store your homemade marshmallow fondant in the fridge for at least 2 weeks. Wrap it tightly in plastic film and keep it in a plastic bag or an air-tight container. Before use just take it out and knead it to warm it up and soften it again. Melted marshmallows and white chocolate, lemon juice and oil is combined with confectioner’s sugar to make a smooth and pliable fondant. Stars and lightsabers for my first project with homemade marshmallow fondant: Star Wars blondie cupcakes with raspberries and liquorice frosting.